Sound Transit’s Federal Way Link Extension has moved into the design phase, two years after all but confirming a meandering alignment along Interstate 5 at the request of local jurisdictions. With construction slated to begin in 2019 and an opening date set for 2024, Sound Transit has compressed the entire station design review process into the next year and change. From now until September 22, Sound Transit is soliciting design feedback through an online survey and public open houses next month. Public feedback will be used to design the stations beyond the concept stage (where they are now) to “reflect the spirit of our communities and residents”. Like the Angle Lake extension that opened last year, Sound Transit has opted to go for a design-build package to expedite the process and bring cost certainties for the project. As we recently reported for Lynnwood Link, Federal Way Link will be subject to current market conditions as well as uncertain federal funding, which may lead to reduced amenities and other corner-cutting measures. The Federal Way Link Extension will have three stations: Kent/Des Moines, across the street from Highline College and one block from Highway 99; South 272nd Street, which clings to a freeway offramp at the current Star Lake Park & Ride; and Federal Way Transit Center, between the current transit center and The Commons shopping center. The station area concepts, posted alongside the survey, give a general sense of what each station will look like, along with its adjacent parking garages and potential sites for transit-oriented development. Kent/Des Moines Station may hold a decent amount of development potential, with its proximity to Highline College and Highway 99, huge staging areas ripe for TOD, and an existing rezone to support 16-story buildings on nearby parcels (among the tallest allowed on Link). The station will cross over South 236th Street, which will gain a new signalized intersection and a bus layover facility next to the parking garage. The RapidRide A Line already serves two stops at S 240th and Kent-Des Moines Road, but the station concept envisions a new stop at S 236th that could supplement or replace one of the stops. South 272nd Street Station, by contrast, has very little development potential, compared to its neighbors. Squished between a large parking garage and an I-5 offramp, one would be forgiven for not seeing the station; the platforms are in a covered trench anyway, so drivers wouldn’t be able to observe the bustling all-day activity at the station. As a consolation, the bus connections are fairly good, with a dedicated bus loop and an additional bus stop on the I-5 offramp, though the latter is hard to find use for, given the truncation of most express bus service to Federal Way. A sizable chunk of the surrounding area is taken up by a forested basin, as well as the eponymous Star Lake a long walk to the southeast. One curious part of the station design is the inclusion of a second entrance on the north side of the platform, far away from the garage and bus stops, and only there to serve a cluster of homes on the dead-end 28th Avenue South. The alignment immediately south of the station will cut across an elementary school’s playground, which prompted a land-swap deal to build a new school (assuming a school district bond measure passes next year) at the site of Metro’s Redondo Park and Ride on Highway 99. Perhaps, with the potential to use the school site for a meager amount of TOD, the station should be shifted south to cross under 272nd Street and have entrances serving both sides. Federal Way’s only station may have the best development potential of all, at the heart of the city’s planned downtown. The station is about halfway between I-5 and Highway 99, to the south of the current transit center. 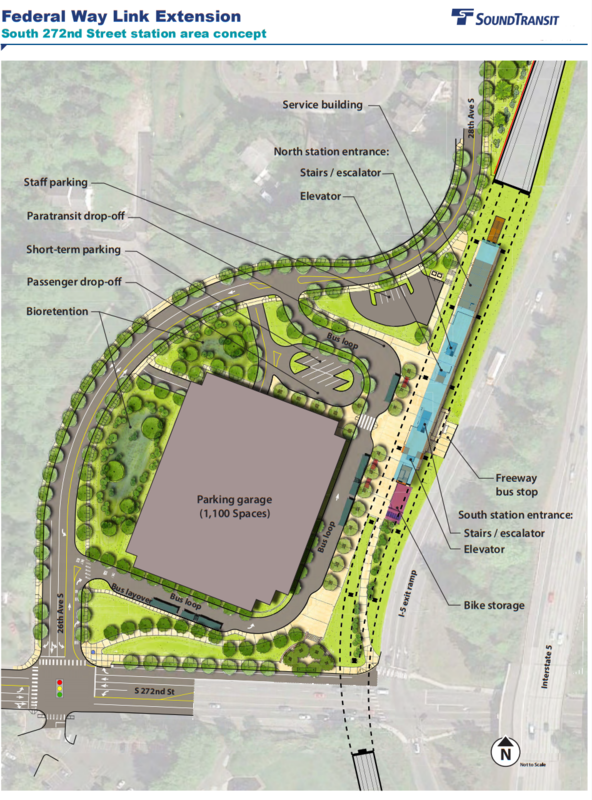 The planned site is currently occupied by a strip mall and large parking lot, which would be acquired for staging; this leaves a pretty sizable amount of surplus land, which Sound Transit’s vision chops up into a small-scale street grid (a rarity in a sprawlburb like Federal Way). 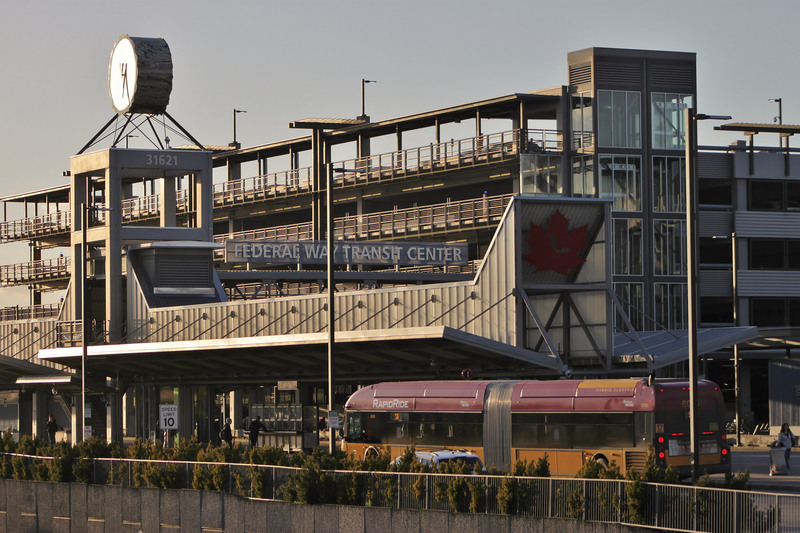 The current transit center would be removed, replaced by a minor street, and buses would instead use a bus-only street under the light rail station, with a direct ramp from the central roundabout. The addition of a second garage at the transit center is a bit overkill, and should be the first thing to go if the project does need to trim its budget. Federal Way seems to be willing to reach for the skies in its downtown, readily accepting proposals for 45-story towers a few years ago before the developer pulled out. Something akin to the high-rise districts around SkyTrain stations in Burnaby and Surrey would fit nicely in the area and is something that the city looks prepared to accept. The current zoning laws allow for multi-family residences of up to 200 feet in height, but that can be further increased with public amenities. Assuming that light rail is built as planned to Federal Way, riders should enjoy a 46-minute ride to Downtown Seattle, only slightly slower than the AM peak travel time for ST Express Route 577. If Sound Transit’s recent TOD endeavors are any indication, redevelopment of the Kent/Des Moines and Federal Way staging areas should come shortly after, if not alongside, the opening of the line in 2024. These new developments may be greeted by already finished neighbors, like Highline College’s five-story dorm for international students, and other private developers taking a gamble on an overlooked market like South King County. I thought as a part of the land swap, the station was going to move south of 272nd, but apparently not. I’m surprised they are not including the current Mark Twain elementary school footprint as construction staging in their diagram. This Star Lake station can be sharply improved by moving it to straddle 272nd, so it can be accessed from both sides of 272 without needing to cross the street.. The north entrance to the station should more or less be where the current south station entrance is. It’s also unfortunate to see no bus priority for buses leaving the bus shelters & running into all of the parking garage traffic. I think it would be better if the buses could turn around within the bus loop & exit where they enter, with a light to bypass the parking queue. And why is there land set aside for staff parking at the top? Surely they can just reserve a few spots within the parking garage for staff? I don’t think I have strong feelings about the other two stations – they seem pretty promising, as they are far enough removed from the freeway to allow for solid TOD in all directions. Where would buses at 272nd go? KDM and 320th will have RapidRide and go to city centers. 272nd doesn’t seem to go to much. One coverage route can serve the houses, but that doesn’t require a big bus loop. That’s fair, I had not thought through which bus routes. I’d imagine KDM & Federal Way will be much more significant transit nodes. But if they are designing off-street bus stops into the station, then they are planning on at least a few routes to layover here, right? Well, Metro’s long-range plan has a Frequent route and three Local routes, so I guess that’s something. The first two go from Federal Way to Kent on Reith Road. The third goes from Auburn to coastal Des Moines and SeaTac. The fourth goes from Federal Way to Star Lake through that area east of I-5 and south of 288th Street. 272nd is one of the few east-west roads that traverses both the east and west hills. It would actually be pretty logical to have east-west bus routes run out towards Covington & Maple Valley and terminate here. Kent Station is nice for commuters traveling at peak hours, but 272nd on the Light Rail could be a good workhorse for trips outside of the limited hours that Sounder runs. Actually, once Central Link runs far enough south, I can see a need for a pretty extensive route restructure in South King County. 272nd is a busy highway that traverses the industrial parks and links further east to the residential neighborhoods. It seems like an obvious choice for a bus corridor, especially once a light rail station is built here. Overall, a disappointing alignment with meandering and forever-train-slowing deviations to reach station site in the locations where people and development actually want to be. On the bright side, it’s great to see a proposed street grid at FTWC to help jump start a small TOD core around the station. This could help grow Federal Way’s core as more than a wide street with a mall. Hopefully the grid won’t be on the chopping block if this extension runs into similar Lynnwood cost issues. While moot, an opportunity sure was lost on SR99 to have these three stations plus an extra two at 216th and 260th to foster far more development in five strong locations rather than two-ish. Imagine what could have been had the elected officials had even an iota of vision. FYI, the 272nd Station is now elevated. The grid won’t be on the chopping, block, not really. If ST doesn’t have the money to build the streets, they can still plat them as streets and turn them over to the city of Federal Way. From there, either the city or private developers would build them. So the chance of losing the street grid is almost zero. – Apparently three escalators and two elevators for each platform (I hope)! – Dedicated areas for passenger drop-off and pick-up as well as paratransit activity! – Why doesn’t ST merely put in drop-off and pick-up areas inside the ground floor of the garage at 272nd, as the people doing this deserve some weather protection and it would save the impermeable area footprint (which is apparently needed around the station)? – 272nd looks very isolated, where the other two stations seem to integrate better with the surrounding redevelopable neighborhoods. Why doesn’t 272nd have better pedestrian and bicycle connections? This design generally appears to be a prison-style approach, designed to make it very unattractive to get to the rail platform without a vehicle. Pedestrian crossings over 272nd and maybe I-5 would go a long way. – Why isn’t there any supporting mixed-use at 272nd? There is absolutely nowhere to go if one is stuck at this station. – Why no 3D concepts generally? Higher-density development makes use of different things at different levels. Parking garages can have drop-off areas or vendors on the ground levels, for example. – What happened to this grand Highline connection that was touted earlier? – Why not a better linkage strategy to the existing FW garage? Bioretention is the technical term used in the WSDOE SWMMWW. Retention is infiltration only. Bioretention integrates plants and bioretention soil mix to facilitate pollutant removal. It is a common practice. Creating fancy graphics costs time and money. I would imagine that some mixed use development will occur near the 272nd station. There is a fair amount of vacant and under-utilized land nearby. Oh I get biorention. It strikes me as a rather humorously ambiguous term though. Technical professionals thrive on new vocabularies every decade or so; TOD was around way before that term evolved, for example. You mean the ped bridge? That was dropped when they decided to put the signalized intersection at 236th; they decided that was enough for adequate access. As a student who currently goes to Highline the signaling is all that is really needed and we are not really in need of a pedestrian bridge. A ped bridge I think would work if we had the student population to justify it. What the area will benefit more so from is a good shot in the arm in terms of potienal development. As the current area around the college, more so Pac Highway is a depressing economic wasteland. Jeshua Crestus, ST, it’s going to be a high rise area. Get your effyouseeking garage OUT of there. Instead, spend the money to build a bus-only crossing of I-5 at 240th and depend on Metro to do the job of getting people there. Oy-vey, don’t just have idiots, we have Olympic Class Idiots!!!! Oops. should have closed the first bold after “area”. Oh, well, I actually feel as strongly about this as all the over-emphasis. The city of Des Moines wants parking, so parking there will be. It’s not in Des Moines. It’s in Kent. And Kent wants a high rise district. And, not to put too fine a point on it, Des Moines could have had the station at HCC, but they didn’t want “those people” polluting their sleazy car sewer of a road. Maybe it replaces the Kent – Des Moines P&R. Will it remain open? If not maybe we can put housing there, not. How will the Federal Way to downtown ride be only 46 minutes? Under today’s schedule it’s 35 mins from International District to Angle Lake. Only 11 minutes to go many more miles on this meandering route? Seems like something is off. Also, is it really the plan to truncate all ST Express service at Link? Probably too early to tell, but no way is this routing faster than existing bus service. KCM has said that it will run Federal Way to downtown express routes. However, Sound Transit will likely truncate it’s buses somewhere along central link, maybe at Federal Way. ST is currently working on their long term plan for ST express buses. Its always been a long term vision of theirs, how practical that will be at service roll-out remains to be seen. Coming from longer distances from the south the transfer penalty I think will be too great, and ridership too high on LINK to effectively truncate anything into it. You may see elimination of the 577 and possible truncation of the 574/578 but I think the 59x series are more or less safe. If the 46-minute travel time sticks I could see Metro reconsidering the Federal Way express buses. That’s a lot of bus hours for a 10-12 minute travel time advantage, and Link’s frequency will mean less waiting which is the second-biggest thing that frustrates passengers. The all-day express-bus overlay was included in the plan probably out of fear that Link’s travel time might be worse than that, and as a political salve that might become less effective over time. I can believe the 11 minute estimate. It’s about 8-9 miles, with only 2 intermediate stops, and most of the distance running top-speed on an I-5 alignment. Part of it may depend on what part of downtown the 46-minute figure is referring to. Is it 46 minutes to Stadium Station, or 46 minutes to Westlake? It’s gotta be IDS, since that’s the closest “downtown” station. And this classic STB post (https://seattletransitblog.com/2015/03/17/federal-way-link-is-not-about-seattle/) about how “Federal Way Link is Not About Seattle” (yet, oddly enough, all the ST Express buses, which are about Seattle, are being truncated at Federal Way Link, which is not about Seattle…) estimates FWTC-Westlake Station at 54 minutes. 46 minutes to IDS would seem to be faster than that estimate would be, depending on how long the tunnel takes (which will be quicker after buses leave). Unless someone did cheat and use Stadium (or even SODO) as their “downtown” station. “Downtown” is usually defined as Westlake, or Pine Street for buses. It’s not that meandering, I-5 and 99 come close together at KDM Staton, and at grade-separated speed it’s not much different than remaining on I-5. Travel time will go down 3-6 minutes when buses leave the downtown tunnel. It’s nine miles so at 55 mph eleven minutes is about right. Come closer to service implementation time I think you will hear a more vocal pierce county. Living in Pierce County and working in Seattle is a stop-gap solution for people who can’t afford to live where they work. Long term, people living in Pierce County need to look for work in Pierce County. My priorities are Link to the airport and to Tacoma’s northern suburbs (Fife, Northeast Tacoma/Federal Way, Kent/Des Moines). So basically about 300 people one direction. In contrast, the 577 carries about 800 people one direction from Federal Way. Ridership could increase as Link adds frequency and reliability, but in general, Link ridership has basically mimicked bus ridership. The UW station is very popular, just as the old 71/72/73 and 43 were popular. If they don’t truncate, ridership will be really low, which is why — despite some objections — they will probably truncate. As far as connecting Tacoma to the northern suburbs, the 574 again serves as a good starting point. It doesn’t serve Fife, but it does connect the Tacoma Dome with these three stops (and Lakewood). Unfortunately, the numbers are even lower in that direction. Less than 250 people a day take the bus towards Tacoma from those three stops. My guess is ridership on this section will be very low, and the addition of the Tacoma Dome stop won’t help much at all. This really is a classic “suburban light rail to a low density city, instead of building good bus service” situation. I’m not surprised Pierce County voters voted against it. @Engineer That would be nice if the jobs were in Pierce County. Instead they are in Seattle, Bellevue, and Redmond. Tech does not appear to be looking at Tacoma anytime soon. Pierce and Snohomish Counties are bedroom communities for King County, and I don’t see that changing anytime soon. There are jobs in this region other than Tech jobs. Highline — Likely the most popular station south of SeaTac. The area has a lot going for it. Not only the college, but it serves as the confluence of major roadways, with good access to Kent as well as the SR 99 corridor. It looks like buses will be able — with some surface work — to get from Kent to their fairly quickly. Likewise, the walk over from SR99 is very short, as is the walk to the college. You could make a good case for it as the terminus, as you get diminishing returns south of there. It still takes a very long time to get from there to downtown, with only the airport as a major destination before it (unlike the north end, which has the UW as a major intermediate destination). Ideally you would add an I-5 transit station, similar to the one serving Mountlake Terrace. That way, buses from Tacoma would be able to drop off people there and quickly get back on the freeway. That would provide fast service to the college and the airport for those who walk across the pedestrian bridge. Hard to imagine high ridership even with all that, but still a better value — and a better system — than going farther south. 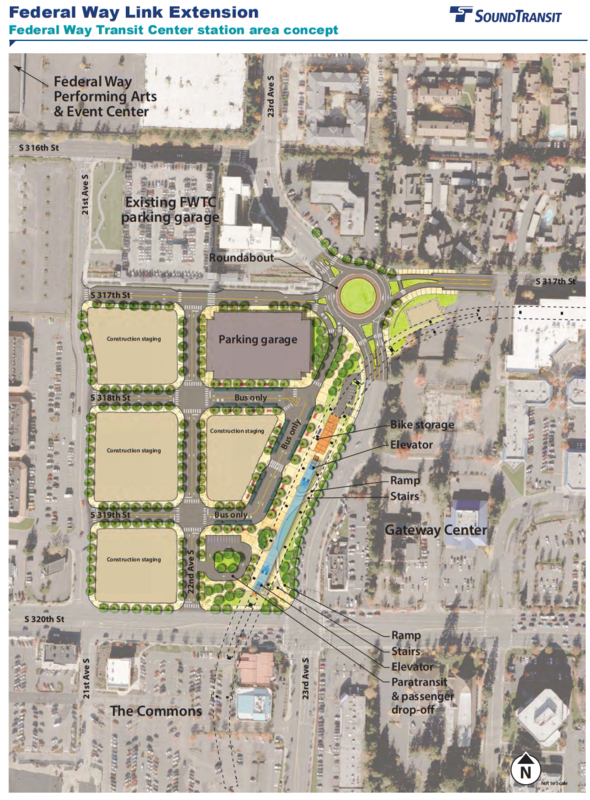 Star Lake — This looks more like plans for a park, rather than a light rail station. To the north there is a nice forest (which I assume is protected) so I guess this is consistent. To be fair, there is relatively high density here. Not as high as a typical Seattle neighborhood, but higher than any place in Shoreline, for example. So it stands to reason that a handful of riders will walk to the station, then ride to the airport, Highline College, or maybe even Seattle (although again, it is a very long trip). Work has been done to make bus transfers easier, but very few people live on the connecting bus lines. 272nd/277th may extend deep into the surrounding “cities”, but much of that is farmland. Who knows, maybe they can add a nature trail by the station, and folks from the city will ride down there, then take a bus to look at some cows. Federal Way Transit Center — Looks terrible to me. This is a low density mall land, surrounded by low density neighborhoods. Like all the stations, half the potential walk-up ridership is cut off because of I-5, yet there is very little gained by being so close. There is potential there, I guess, but that is another way of saying there is nothing there. You have to be very optimistic to think a place next to the freeway, 45 minutes from Seattle will suddenly be the next South Lake Union. It could happen, but I have a hard time seeing how a train to the airport and Highline college (along with a slower ride to downtown Seattle) will help that along. I’m optimistic on Federal Way – “mall land”, low rise commercial/office space & parking is much, much easier to redevelope than SF residential. And Ross, I think you consistently underestimate how long people are willing to commute to get to work. Yes, people prefer commutes under 30 minutes, but given more and more people are “supercommuting” out of financial necessity, I think longish Link travel times will not deter riders. In other words, if thousands of people are willing to drive into Seattle from Lakewood, Marysville, Monroe, or Snoqualmie and sit in all that freeway traffic, surely a few thousand people will be happy to live in Federal Way and sit on a train for 45 minutes to get to work. A few weeks ago I rode the Blue line in Chicago from O’Hare to the loop, which is right about 45 minutes. I boarded at 6am, and sure enough each stop picked up a dozen or so commuters heading into downtown. The train started out nearly empty so those people could grab a seat and pull out their book or phone. By the time we go to the more urban neighborhoods, it was standing room only – which worked, b/c it’s OK to stand if you are only riding for 15~20 minutes. And regardless, Tacoma and SeaTac are both robust job centers that will generate reasonable all-day traffic themselves. I would have to agree with AJ about Federal Way. Shopping centers are usually just cheap concrete blocks and asphalt, and more easily can be redeveloped into higher-density developments, perhaps even easier than if it was vacant land. These areas also tend to have larger parcels in common ownership, so that it’s easier for a developer (when finally motivated to do so) to create high-density development because there isn’t the pesky requirement of assembling parcels owned by lots of people. It’s far enough from the SeaTac runways where airplane noise won’t be much of an issue for residences. Finally, anything built about 5 or 10 stories there will have a fairly spectacular view of Mt. Rainier! It’s a much easier place to redevelop than something like Rainier Beach, which has lots of small parcels, lots of different kinds of land uses, more neighborhood opposition to taller buildings and more difficult freeway access. I’m hugely impressed with Federal Way’s upzone. I’m not sure how successful it will be because FW is 45 minutes from Seattle and has even less cachet than Lynnwood. But if even half of it is built out that will be something. And as the population increases, maybe we’ll eventually need a large downtown between Seattle and Tacoma. One interesting point is that 45 minutes is how long BART takes from Embarcadero to Fremont. Fremont seems to be more robust than Federal Way (in terms of industrial/retail jobs and transit-riding residents), plus Fremont hasn’t even tried to reach its potential of a mixed-use midrise station area, so that level could be obtained if it tried. Perhaps Federal Way will go a similar route, with maybe less jobs but more mixed-use achievement. The scale of distances is different here: it’s more outlandish to go 20 miles out while in the Bay Area it’s perfectly typical to go 35-60 miles, so that may be a drag on Federal Way’s performance, but maybe it will seem more typical in 10-20 years. Fremont is really a Silicon Valley suburb much more than it’s a San Francisco suburb. While it’s true that there are lots of commuters from Fremont and Newark (the doughnut-hole city that voted to not merge into Fremont) that work in Oakland and San Francisco, more work in Santa Clara County. It’s just that those workers that go all the way to San Francisco will take BART because their freeway options take much longer than BART does. The recent opening of the South Fremont/Warm Springs Station is actually a great area to watch when it comes to TOD. That area was up until recently vacant or single-story industrial, so the parcels are very large. As a result, major builders (Lennar, Toll Brothers) as well as some other development groups, have very ambitious development projects in progress. There are several thousand new dwelling units planned, with several million square feet of employment space. The Lennar development alone is planned for 111 acres with 2,214 dwelling units and 1.4M in commercial and industrial square footage, in addition to a new 4-acre park and an elementary school. It’s a good example of how transit can become a catalyst for significant development if the available land can be assembled. The one noticeable problem is that the very large parking area next to the BART station remains for now. I just don’t understand why it’s preferable to anyone that we spend so much money zigzagging around plowing through residential neighborhoods in lieu of a straight shot down SR-99. Is the construction impact on fast food joints and strip malls really that important? Just goes to show who holds the lobbying power: business over people. I imagine that’s because demolishing low-income apartment homes requires less compensation than upsetting the local chamber of commerce. It’s not because of $300m. It’s because Des Moines and Federal Way were absolutely adamant that they didn’t want Link on 99, and Des Moines threatened to sue ST if it did. Des Moines is concerned about displacing those strip-mall businesses, and the loss of low-cost storefronts for immigrant entrepreneurs. Federal Way is most concerned about travel time and the fear that the $300m difference might be the stone that prevents Link from ever getting to Federal Way at all. 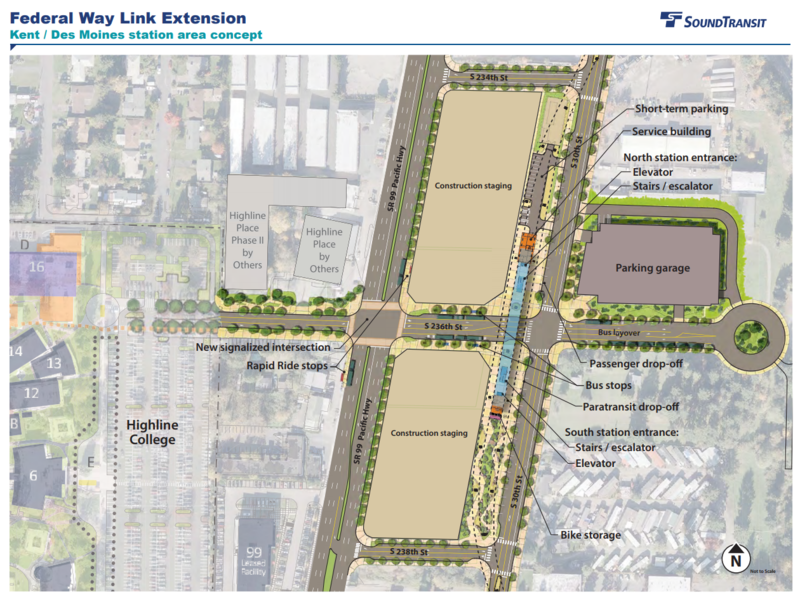 Federal Way really, really wants Link, similar to Issaquah. Federal Way believes I-5 travel time will probably be better, even though the studies say it’s the same either way. Never mind that Kent wants Link on 99. The risks of disappointing Kent and the people who would live in those mixed-use station areas were apparently less than the risks of enraging Des Moines. As zig-zags go, this is very slight. Even the Highline station is only a block or two from I-5. It’s not like SR99 is a great residential street either. Traffic zooms on that road! Creating walkable TOD areas like the ones shown here at Highline and Federal Way — with slower-speed streets between SR 99 and I-5 — is much safer station area design. No garage at Kent-Desmoines. No, I’m not going to make a hideous blob of a post. But NO GARAGE AT KENT-DES MOINES Road! Period. It’s far too valuable for that. Instead spend $30 million for a bus-only overpass or under-pass of I-5 at 240th. There’s literally NOTHING THERE along it on either side of the freeway. So now is the time to secure that critical cross-county bus right of way with newly added exclusive lanes between 20th South and Military Road South. The through Rapid Ride from Des Moines to Kent would run eastbound on K-DM to 20th South, turn right to 240th, turn left and then stop at the south side of Highline College, turn left (bus priority left turn signal) onto SR99, north to 236th, right to the bus zones, right on 30th to 240th, left on 240th to Military and north to K-DM. The westbound route would be left on Military (new bus-only left turn ramp and right-hand bus-only lane to 240th), right on 240th, right on SR99, right on 236th to the bus zones, right on 30th South, right on 240th, stop at southside Highline, right on 20th South, left on K-DM. Though this might be a tiny bit farther than running on K-DM to SR99, left to 240th, right to 20th, and right to K-DM (the alternative), it would avoid the two lights at the freeway, and a left turn onto SR99 from K-DM (arrgh!). And it puts transferring passengers directly below the station, not half a block and a wide car sewer away. Buses coming from K-DM that don’t use 20th in order to serve Highline College would simply continue past SR99, right on 30th, right on 236 to the westbound bus zones, right on SR99, left on K-DM to return. Buses from the south other than the A-Line, would go north to 236th, right on 236th to the bus zones, right on 30th, right on 240th and either straight on 240th or left on SR99. Buses from the east on K-DM or arriving from the north or south on Military Road would follow the westbound RapidRide route listed above but turn left at 240th after visiting the station to return to their collector routes. And such collectors which would be through-routed across SR99 would follow the E-W RapidRide route both ways on 240th. Notice that every bus on 30th South is headed southbound and accesses the street with a right turn. That means that a single south-bound BAT lane could be laid on the newly rebuilt street and serve every bus that “terminates” at the TC and the Kent to Des Moines RapidRide. A matching BAT lane between 240th and K-DM northbound on SR99 would be in order as well. The only route that would pickup and discharge passengers on the west side of SR99 would be the A-Line. I grew up (and my parents still live in that house) about 1.5 miles from the Star lake Station. It’s technically Kent, but I attended the Federal Way School District. I wonder if those suburban neighborhoods on the West Hill will see a resurgence in interest after rail arrives? My parents are excited, as they currently use Link to go downtown and to Husky Football. They don’t even consider driving anywhere north since Link arrived (well, except for the drive to the P&R). The current P&R is well utilized by commuters, but I worry about ST’s investment, in terms of cost/benefit. Will it have valet parking?